Ah, the horse twitch, (the tool you see pictured here). 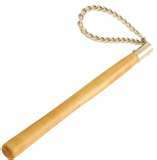 It’s a wooden handle, and the loop you see is typically made of chain. “How do you use it?” You ask. 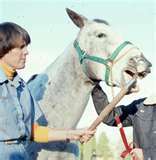 The loop is placed around the upper lip of a horse, then the wooden handle is twisted, pinching the lip inside the tightening chain. (Now look at the second picture.) Ouch! Right? Well at least that’s what I thought when I first saw this done. My husband’s grandfather used to be a farrier, (someone who shoed horses). He told me, “Not every horse has to be twitched to keep still, but it always does the trick if they won’t.” Well, no kidding, just imagine how still you’d be if someone had your upper lip in one of those. But as painful as it seems, this tool is very important. If a horse jerked or kicked, while shoeing, the farrier might cut into the soft issue of the hoof. This would lame the horse forever. And if you can’t use ‘em, you sell them to the glue factory. Unfortunately, on a farm, it’s not wise to waste hay on an animal you can’t use anymore. My Dad once told me that a mule will live 30 years just to get a chance to kick you. Farrier business is horrible, sweaty, dangerous work. How is your writing going? What have you heard back? Send me something. The contract for “Duke” was signed in October. It won’t be out until 2014. I haven’t heard anything yet for the picture book I submitted in September, but it’s early still. I have an idea for another children’s book but the inspiration for the beginnning hasn’t hit me yet. I’m working on book two for the “Duke” series. At 50,000 plus words right now, I know I’m more than half way there. Don’t worry I haven’t forgotten you. You are a great assest to me, your comments and editorial help are amazing, and always needed. But you were the best darn yell leader. I loved cheering with you.